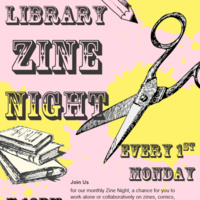 for our monthly Zine Night, a chance for you to work alone or collaboratively on zines, comics, artist books, or other paper projects in the library. Ingenuity, creativity, and inspiration. A desire to show off or learn new techniques. A want to work nd get to know other zinesters and artists? Staplers, trimmers, basic drawing supplies, paper, adhesives, scissors, discarded book scraps, scanners, photocopiers, and occasional guest how-tos.